Intended to provide students with targeted practice, this book is the first to offer unparalleled, no-frills access to real LSAT questions grouped by question type, with explanations written by Manhattan Prep’s expert LSAT instructors. 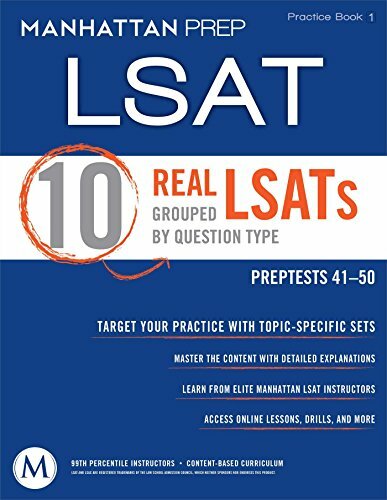 Designed as a study aid for the students of Manhattan Prep’s elite LSAT prep classes, 10 Real LSATs Grouped by Question Type provides students with an opportunity for targeted practice. Cut from Practice Tests 41-50, this book allows students to hone their skills on specific question types in Logical Reasoning, Logic Games, and Reading Comprehension, including Assumptions, Inferences, Binary Grouping, and more. In-depth explanations for every question are written by Manhattan Prep’s expert LSAT instructors and feature hand-drawn diagrams that allow students to get inside the mind of a 99th percentile scorer. By providing a means for targeted training, 10 Real LSATs Grouped by Question Type is an invaluable study tool, enabling students to get acclimated to the nuances of the exam and achieve a higher level of mastery on every question the LSAT has to offer!